« Interview with MC entertainment, a group of Indonesian Kpop dance cover teams. Interview with Joanna, a British girl in love with K-pop and Korea. 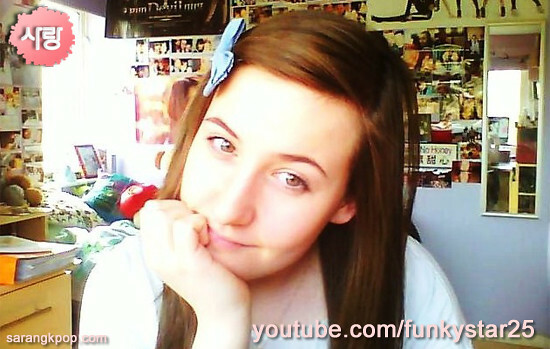 A couple of weeks ago, an English girl posted her youtube vidoes on Korean online communiy boards. She even wrote some words in Korean and replied to Korean netizens’ comments. We sarangkpop wondered who she was and had an interview with her at last. 1. greeting to Korean netizens. 2. please introduce yourself briefly. 열 일곱 살이에요. 저는 영국고등학생이에요. 저는 채식 주의자!! 저는 많는 취미를 가지고 있어요. 저는 지금, 방학을 해서 참 좋아요! 3. how did you come to learn Korean? My best friend at school was Korean. I started to pick up Korean from spending lots of time in her room while the other Korean girls and her watched Korean dramas. I eventually decided I had to learn Korean so I could understand what everyone else was saying. They also introduced me to 빅뱅(big bang), 소녀시대(girl’s generation) and 원더걸스(wonder girls). 4. I think that your Korean pronunciation is very good. How do you study the Korean language and practice the pronunciation? Hmmm…. I went to Korea in 2009 with my friend and learnt to read Korean at 노래방(Noraebang). I think my pronunciation is quite good because I spend a lot of time with my Korean friends and I’ve been lucky to spend time in Korea. I didn’t really get a chance to study until I completed a summer course at SNU. 5. we understand that you are currently studying Spanish, French, Japanese, Chinese and of course Korean. You must be a genius! :D Which language do you think is the hardest one? Hmmm…. my teachers think I am “gifted” for asian languages as I seem to find them fairly easy to pick up and pronounce(I just released my first Chinese cover this week). However, I find European languages like French really difficult – so, for me, French is definitely the hardest! 6. You went to Korea and studied Korean at the Seoul National University for TWO months. How did you get to go to that prestigious university? I applied when I was still 16 – which was very young for the program. Initially, they didn’t want to take me because I didn’t have my high school diploma yet – only my middle school one- but I called a lot and got letters and reports from my school to prove I was a good student and eventually, they let me join the course. 7. you spent TWO months year in Korea. I hope you had a great time there^^. What do you remember most from your Korean stay? I have a lot of wonderful experiences from Korea and I am incredibly grateful to all the Korean people who helped me during my stay. I think my best experience was also the funniest. Some of my mixed Korean friends from my course invited me to go to 찜질방(JJimJilbang), the Korean bath-house. My friend told me to bring my swimsuit so I got really excited. We arrived and I got changed into my swimsuit and I looked around…and everyone else was naked! So I told them to hurry up and get dressed. My friend 세라(Sarah) explained to me that in the women’s section everyone bathes naked…you only need the swimsuit for the swimming pool.I am English…so this was really strange for me as we don’t do this! I stood there for ages, deciding what to do, until they said “Fine- we’re going! Are you coming or not?? ?” So, I took a deep breath and went with them! It was the scariest moment of my life!!! ^.^ (Especially, as everyone stared at me because I was the only white person!) But after 5 minutes, I totally forgot about it and it was the best day out!! Now, I really miss 찜질방(JJimJilbang)! 8. you uploaded a picture taken in Busan. How come did you go down there and what did you do? I found myself with some spare time towards the end of my trip so I decided to travel down to Busan and GyeongJu. I visited 불국사(bul-kuk-sa) Temple and 석굴암(suk-gul-am) grotto as well as the National Museum in Gyeongju before travelling to Busan where I visited 자갈치시장(Jagalchi Market). I even ate some of the fish, despite being vegetarian- it was really good! 9. how did you get to know K-pop? 10. what was the first Korean song you sang? 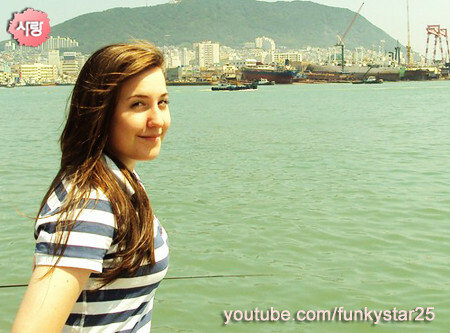 On Youtube, the first solo Korean song I sang was 말도 없이(Without words) from the soundtrack to 미남이시네요(You’re Beautiful). 11. who’s your favorite K-pop artist and why? Previously, I was a major 이효리(Lee Hyori) fan, I still am but these days I also really like 종현(Jonghyun) (샤이니,Shinee), 태연(Taeyeon) (소녀시대, SNSD) and 아이유(IU) because they’re all amazing vocalists in their own right and I could listen to them sing forever! 12. we see some K-pop artist posters in your room while watching your video^^. How did you get them? Can you buy in the UK? I actually bought a lot of them while I was in Korea (I have a collection of about 20 under my desk^^) but my best friend’s Dad regularly travels around Korea so sometimes, if I’m lucky, he gets them for me too! 13. you auditioned for the MBC 워대한탄생(MBC Star Audition). And we understand that you reached the second round in Korea. It seems that you really enjoyed it. Tell us how you feel about it. Hmmmm….8월에 서울을 떠나서 12월에 도라왔어요. 그러니까, 전 친구들 만났어요. 저는 진짜 행복했어요. I did not think I would see them for a long time, so it was great to meet them again. I also made lots of new friends from around the world so it was a really great experience! The judges told me to work on my technique and not to get so nervous- I have been working on this so if we meet again, I can show them the improvement! 14. why do you sing? Does singing make you happy? Any special reason? For me, singing is way of releasing emotion.Singing can calm me down if I’m angry or make me happy if I’m sad. It’s also a lot of fun and I love sharing my love of K-pop with other K-pop fans. When people comment on my videos that the song has cheered them up or made their day, it makes my day too – I like making other people happy with my music. 15. your favorite k-pop cover so far? I really enjoyed doing my cover 꺼져 줄게 잘 살아(I’ll Back Off So You Can Live Better) as it’s also had the biggest response but I’ve also enjoyed doing something a little out of my comfort zone, the ballad ‘겨울아이(winter child)’ from the 드리하이 OST as it was a lot harder to do! I love a challenge!